This baked ziti is packed with meat, cheese and delicious spices. 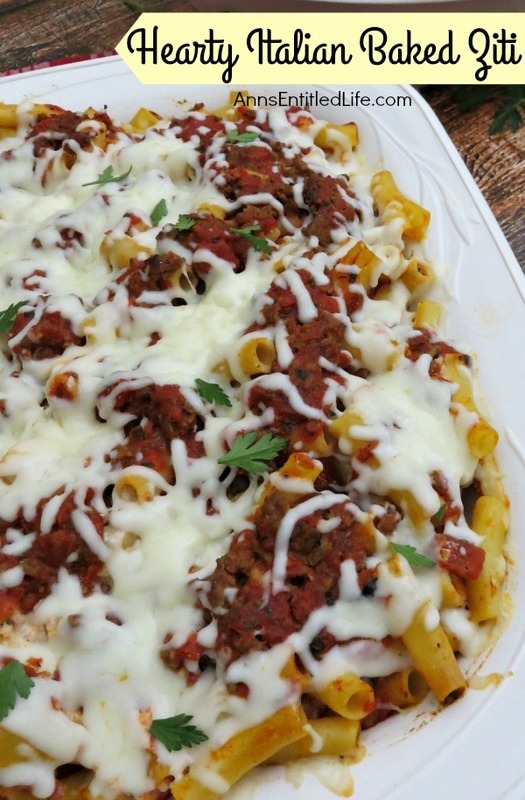 A filling dish, this Hearty Italian Baked Ziti will become a family favorite! • Preheat oven to 375°. • Spray a 13″ x 9″ baking dish with non-stick cooking spray; set aside. • While the pasta is cooking, heat the olive oil in a large pan. When the oil is hot, add the ground beef, basil, thyme and oregano. Break the beef up with a spoon and cook over medium heat until cooked. • In a separate pan, cook the Italian sausage until done, breaking it up into small pieces with your spoon. Drain and set aside. • Add the crushed garlic and the cooked Italian sausage to the beef mixture; cook for additional 1-2 minutes. • Add the marinara sauce and diced tomatoes to the meat mixture; bring to a simmer. Continue to cook over medium-low heat for 7 minutes. • In a separate bowl, mix the ricotta and egg until smooth. Add 2 cups mozzarella and 1 cup Parmesan cheese; stir to combine. • In a very large bowl, toss the pasta with 3 cups of the pasta sauce; add ricotta mixture. Stir to combine. • Pour half the mixture into your prepared baking dish and top with half of the remaining sauce. Add the remaining pasta mixture and gently flatten with a spatula. Pour the rest of the sauce over the top and cover tightly with aluminum foil. • Bake for 45 minutes, uncover and top with 1 cup mozzarella cheese. Bake an additional 5-10 minutes or until the cheese is melted and bubbly. • To save on bowls to wash, use the pasta pot to mix everything. It’s large enough and only had water and pasta in it. • Additions to consider: extra marina sauce, crushed red pepper, salt and pepper, fresh basil, fresh parsley. • Cook the Italian sausage separately because it releases a lot of fat. You can drain it, and that helps prevent the sauce from becoming too greasy. • If you don’t have lean ground beef, you’ll want to brown that off by itself (with no spices), and then return it to the pan with the spices, sausage and garlic. • This will keep up to 3 days in the refrigerator and freezes well! 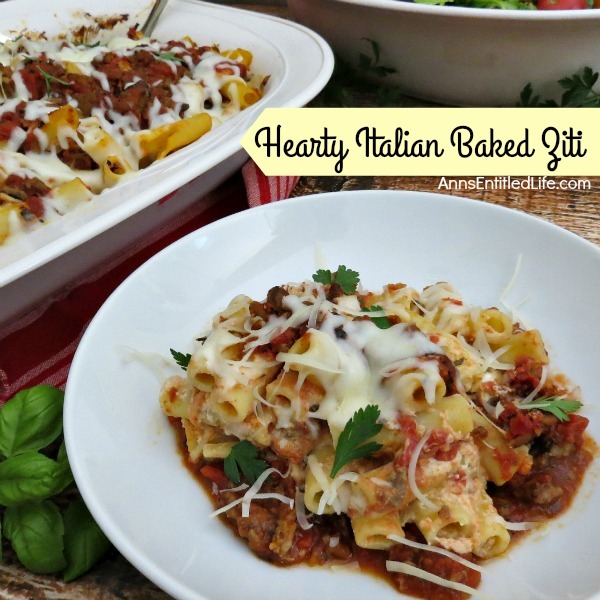 • To print the Hearty Italian Baked Ziti recipe click here. Thanks for joining Delicious Dishes Recipe Party! Hope to see you back again TODAY! The party is now open and waiting for you! 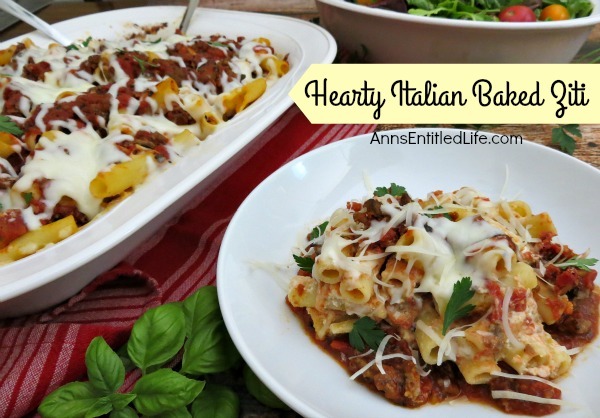 The Hearty Italian Baked Ziti was delicious! You created a very straight forward recipe that was easy to follow and really great! It also reheats extremely well. I got huge raves from the men in my life. Thanks!